What has been used in the making of the product, were good quality ingredients used. How was it made – does it appear to be well crafted and carry a good guarantee. Where was it made. Do I know who made it (my preference). Can I find someone to talk to if I have a problem. Have the people who made it been treated fairly. I find it difficult to enjoy anything that I feel an under-paid, mistreated person made. Does it look good, have all edges been finished, no dents, bangs, hanging threads, etc. And lastly, will owning it make my life better and involve very little work on my part? If a product meets these standards and is at a price I feel is fair then I will buy it. And 99% of the time I am happy with my purchase. So we try to apply these principles to the products we make at the Bay Hammock Company. We purchase high quality materials to make our hammocks – products we know will stand up to the Canadian weather. Each hammock is made by hand by skilled, well paid artisans who take pride in their work and the hammocks we make. We stand behind our products with a 5 year guarantee on most. Our hammocks are made in Seabright Nova Scotia, Canada. You can call us at 1.888.820.3045 and chat with Arch, the owner, or Lynn, our master hammock maker. Each hammock is carefully finished and tested (we love that part of our job) before it is packaged and shipped to you. If, like us, you are lucky enough to live in Nova Scotia, you can drop in and test the hammock yourself before you buy. And of course, owning a Bay Hammocks hammock will make your life better. How could it not? Which hammock or hammock swing is right for you? Well that depends. If only the best will do you want a handmade nylon hammock or hammock swing. These hammocks are soft as silk yet very tough. They do require a bit of care though. 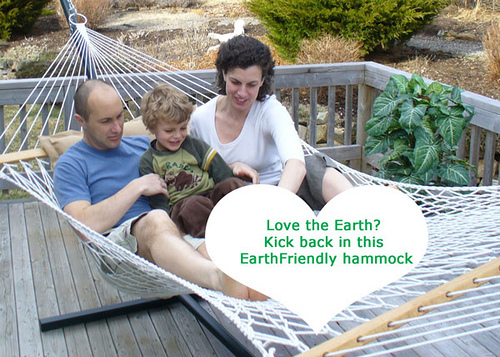 If you are concerned about the environment consider an EarthFriendly hammock or hammock swing – It is made of recycled plastic (mostly soft drink bottles). Our olefin hammocks look great and are tough as nails and a little lower price than the nylon. And finally, our net hammock or hammock swing – It is made with sports net and is really good value if you have children or want to use it at the cottage or camping. It requires very little care and will last for years. The one in the picture at the top of this blog has been hanging in place for 4 years – usually it is put away in December and is rehung in April but it has seen its share of snow and ice. Ask yourself, would you trust this family’s or your family’s safety to a cheap, badly made hammock?